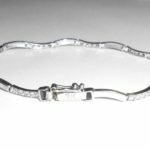 Vintage British English solid 9K White Gold modernist diamond bracelet. The diamonds are older, all original, natural and non enhanced. They are fine quality SI1/2 clarity and eye clean. Total carat weight is approximately .64 carat. All of the stones are bright, sparkly and noticeable. Weight is 5.5 grams. 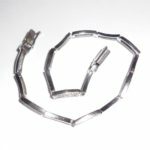 Size is 7 1/4″ long end to end. 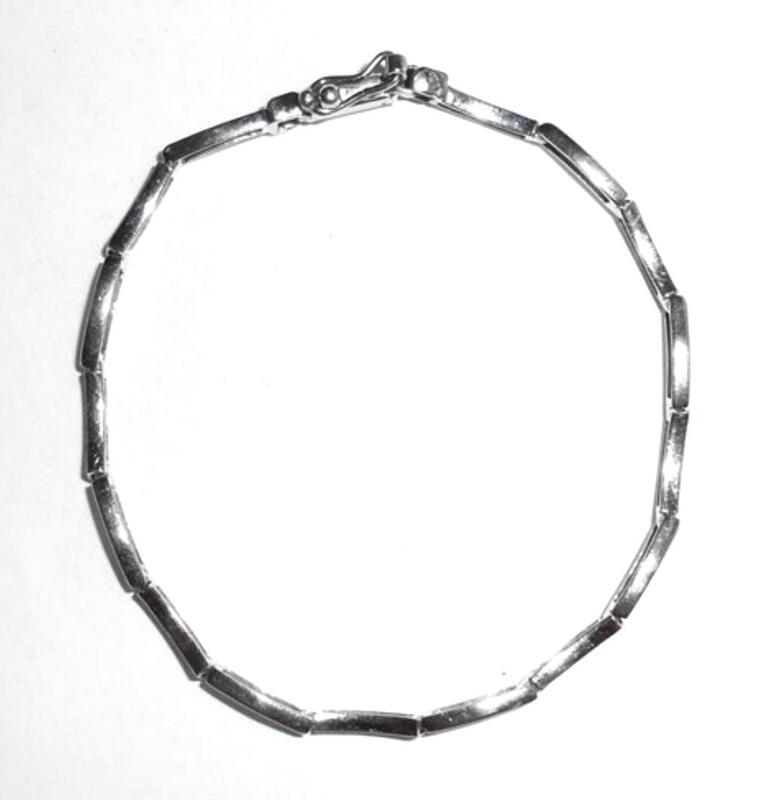 Height is 1/8″; this bracelet sits pretty flat on the wrist. Width is 3/16″. 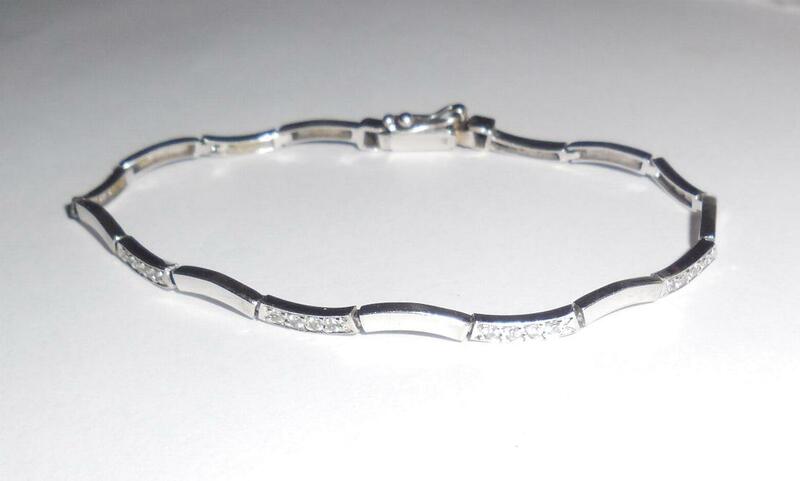 In excellent used condition this is a lovely vintage diamond bracelet for your collection. No dents or dings or damage or repair. 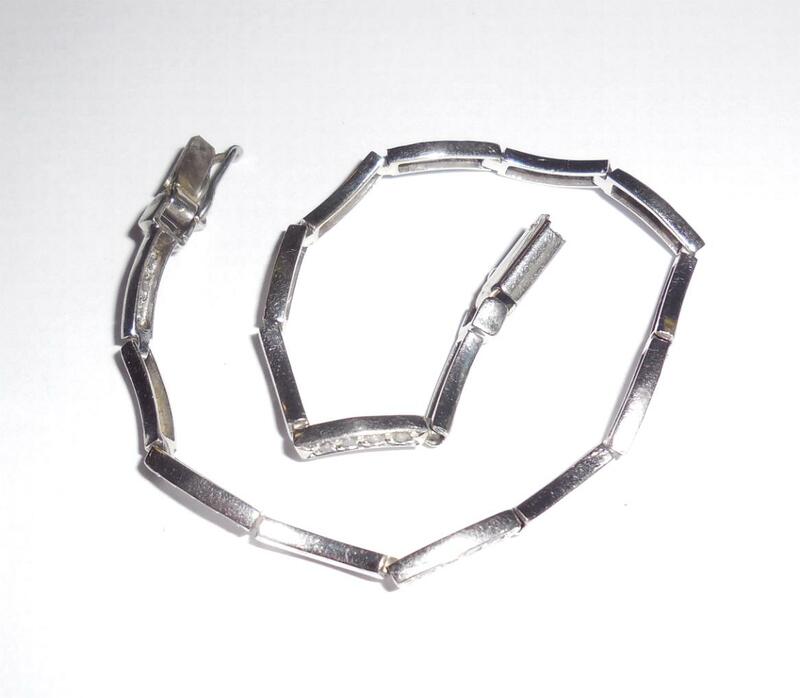 This is a vintage late mid century modernist diamond bracelet with unusual geometric linkage. The links are long, curvy and narrow. Yet, they are square in diameter. 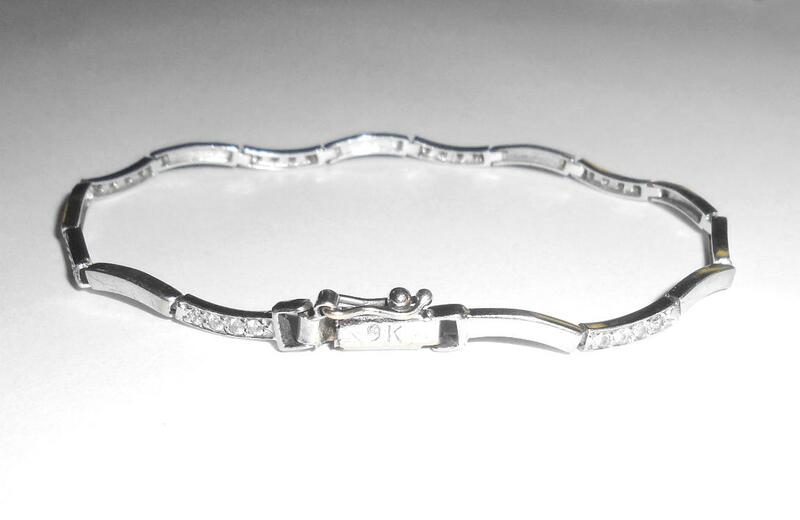 It is marked 9K and is also jeweler tested. 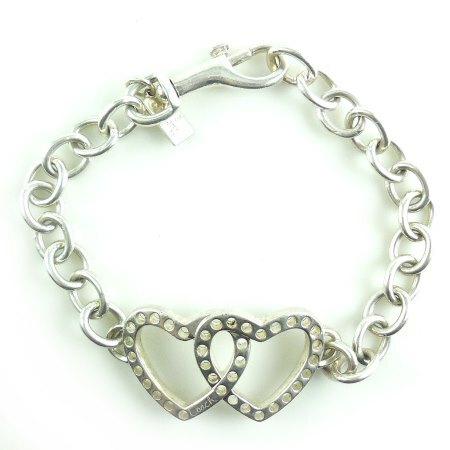 Guaranteed to be solid 9K white gold. The diamonds are older, all original, natural and non enhanced. They are fine quality SI1/2 clarity and eye clean. Total carat weight is approximately .64 carat. All of the stones are bright, sparkly, clear and noticeable. Weight is 5.5 grams. Size is 7 1/4″ long end to end. 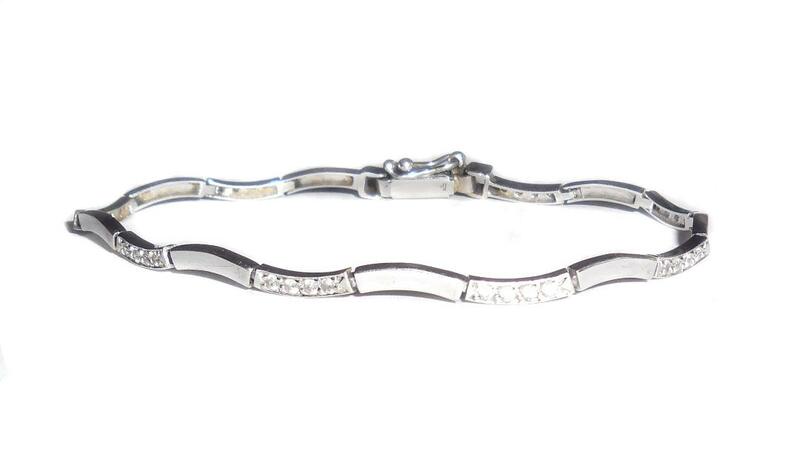 Although the height is 1/8″; this bracelet sits pretty flat on the wrist. Width is 3/16″. Condition is excellent, gently used. There are no repairs or alterations of any kind. All of the diamonds are well matched in both size and color. Gold has light surface age scratches but no deep scratches, tears, or dents. 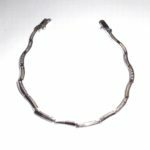 It is narrow yet boxy with unusual linkage so it looks good whether worn alone or as a gemstone stacking bracelet. Very late mid century into the 1970s when layered look was prevalent. 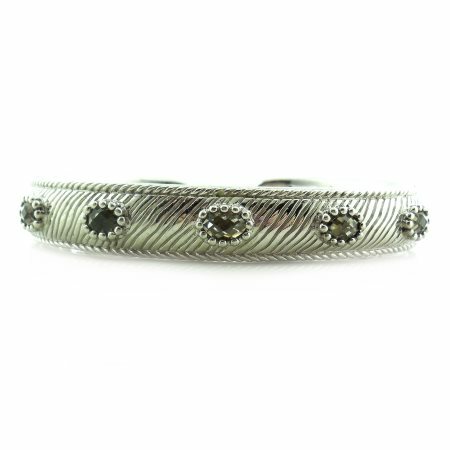 Therefore, this is a lovely vintage mid century 9k white gold diamond bracelet 7.25 for your collection. New York–Mid-century Modernism is marked by clean lines and bold, abstract geometric shapes. 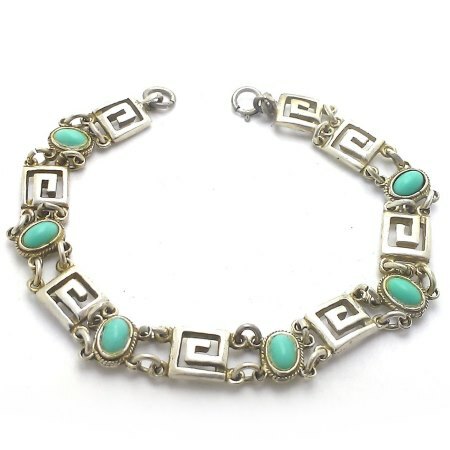 Designers in the United States, as well as those from Scandinavian countries and the silversmiths of Mexico, went for sleeker designs in an effort to distance themselves from the heavy statement pieces popular in the early 1940s. Geometric designs were a key theme in Mid-century Modernism. 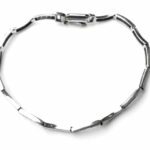 Most of the jewelry was crafted in silver, partly due to Scandinavian influence (Scandinavian jewelers traditionally have worked in silver) but also the Bauhaus movement, which called on art in all forms to be affordable. 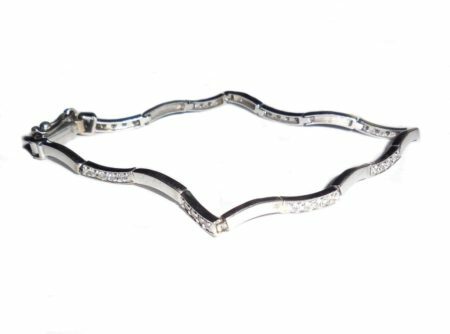 In excellent condition this a gorgeous Judith Ripka 925 sterling silver hinged open cuff bracelet with bezel set ginger quartz gemstones. Each stone is a fancy briolette oval cut and measures just about 7mm. Better than the photos could ever capture these stones are sparkly with golden brown internal highlights much like a brown smokey topaz. 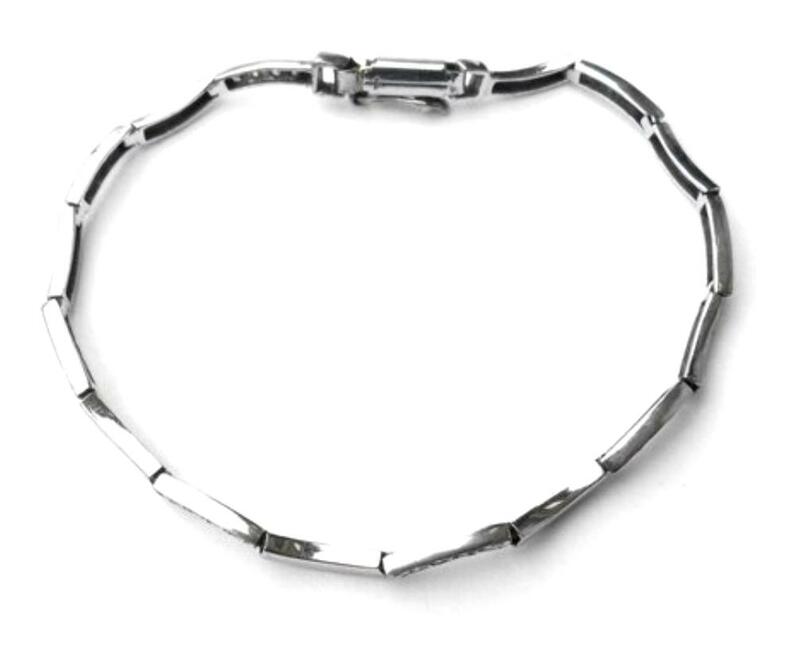 The inside circumference is 6 3/4″ so it should fit an average medium small wrist. I am a 6 1/2″ and it has some sway on me. Width across the top is 3/8″. Condition is excellent, very gently used. 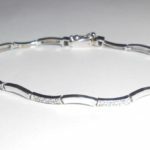 No wear to the sterling silver or the stones. 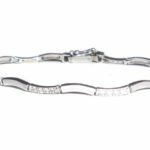 As you would expect from Judith Ripka this bracelet is extremely well made. The sterling is very thick and substantial. 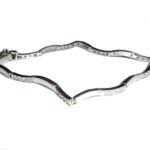 This is a stunning original jeweled Ripka bracelet for your collection. This is a very well made, high quality, Italian 925 sterling silver 8mm beaded bracelet with a 10m hidden clasp. 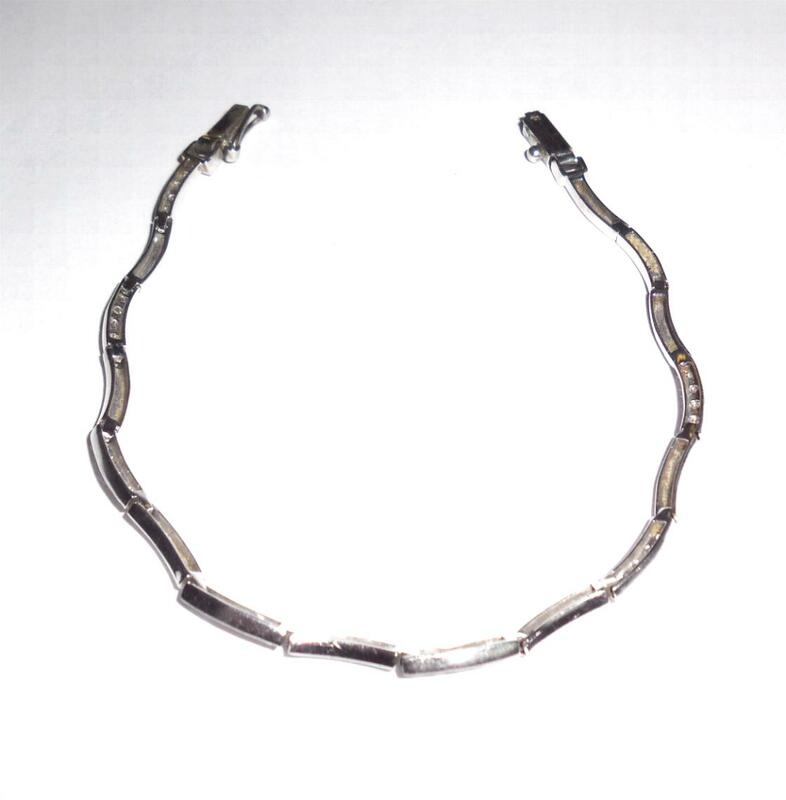 It is magnetic, strong and very secure. Won't dislodge or fall off. Condition is excellent. No damage or repair. Weight is 18.2 grams. 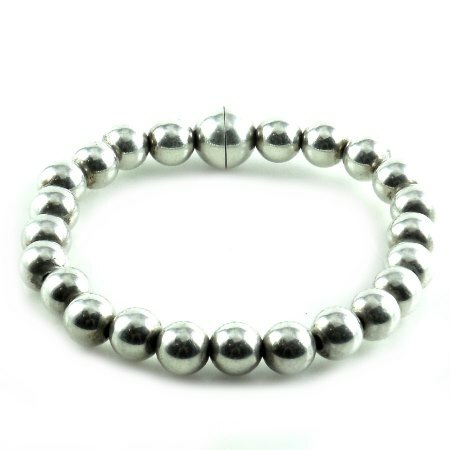 This is a beautiful showy sterling bead bracelet for any occasion or for daily use.